Due to continually increasing phytosanitary restrictions, FPS is no longer exporting plant material outside of the United States. 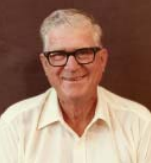 The FPS rose collection was established during the 1960s by Dr. George Nyland, a UC Davis plant pathologist. Nyland was convinced that rose mosaic disease was a problem in roses that needed to be addressed by a program of virus testing and heat therapy for virus elimination. When he found an important cultivar infected with rose mosaic, Nyland employed heat therapy, a recently developed virus elimination technique, propagating from plants that were grown at 100°F until he was able to find a healthy version of the cultivar. This work lead to the establishment of a virus-tested collection at UC Davis. Budwood from these plants was made available to nurseries and growers to serve as a source of propagating stock. Throughout his career, and even after his retirement in 1985, George Nyland was a tireless advocate of virus-tested planting stock for rose nursery propagation. By the early 1990s, the FPS rose collection was in need of repropagation and retesting. The plants were aging and less productive, many newer cultivars were not in the collection, and the roses had not been retested for virus in many years. FPS began working closely with the garden rose nursery industry which led to planting a new foundation rose collection in 1995. 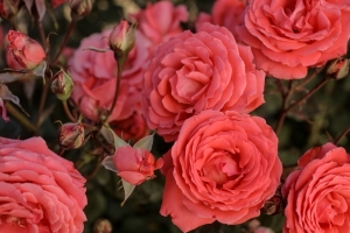 This rose collection has become an important resource for nurseries and growers throughout the United States as a reliable source of clean budwood of many major rose cultivars. The current collection covers eight acres and includes more than 538 rose scion and seven understock cultivars - the largest public collection of virus-tested roses in the United States. Each year new cultivars are added to the collection after virus testing and, if necessary, virus elimination treatment. 1. New introductions, called “candidate selections,” are typically sent to FPS as dormant, bareroot plants. 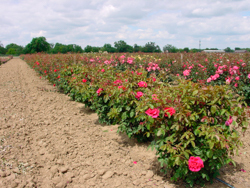 Candidate selections may originate as AARS winners, advanced selections of a rose hybridizer, or the proprietary selection of a commercial rose nursery. There is also a growing interest in bringing historic or “heritage” roses into the program to ensure that they are available free of rose mosaic. After potting and labeling, plants are placed outdoors at the FPS nursery to grow under ambient conditions. 2. Disease testing for viral pathogens is the first step for inclusion of a candidate selection into the collection. In March and April, samples of young leaf tissue from the candidate plants are tested by the Enzyme-Linked Immunosorbent Assay (ELISA), a serological test conducted in the laboratory. Then, after the first flowering, mature budwood from each candidate rose is graft-inoculated onto both Shirofugen cherry and Burr multiflora rose for biological indexing. Combining the results of these tests gives a greater accuracy for virus detection than relying on any single test. Two to three years are required to complete all tests. 3. When initial testing demonstrates that a rose cultivar is infected with a viral pathogen, heat therapy or tissue culture procedures are begun for virus elimination. All tissue culture selections and plants that were propagated from heat-treated buds must undergo complete ELISA, Shirofugen cherry and multiflora indexing to determine whether the virus elimination treatment was successful. (Details in Virus Elimination Therapies). Once the ELISA, Shirofugen cherry, and the first year of multiflora tests are negative, rooted cuttings of the candidate selection are propagated in FPS greenhouses in preparation for establishment in the field collection. During the second spring after the inoculation, the multiflora indicator plants are reinspected. 4. Only when the candidate selection is found negative for virus by each testing method are the rooted cuttings finally planted in the FPS rose collection. Whenever possible, new introductions are planted as cuttings on their own roots to reduce the possibility of introducing virus through an infected understock and to prevent the problems associated with rootstock suckering. The FPS rose collection is regularly retested by ELISA for reoccurrence of virus. The plants are also visually inspected in the spring for virus symptoms. 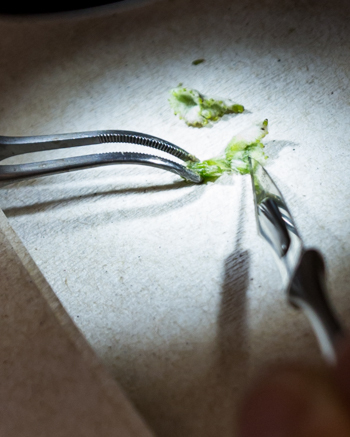 As the selections mature, the rose collection is carefully examined for correct identification and trueness to type. FPS holds regular meetings with professional rose propagators and breeders who inspect the collection. Any selection that is not up to standard is rogued out. If questions arise about the identity or productivity of a selection, it is flagged in the computer database, restricting distribution until a conclusive determination is made by industry representatives. The quality of the rose program is enhanced as the rose production industry reports back on its experience with the plant materials originating from the FPS rose program. 5. Dormant budwood is cut and shipped from the FPS rose collection in early November. Cuttings are distributed in 9-, 18-, or 27-inch lengths. After labeling and bundling, the dormant budwood is kept in cold storage until shipped or picked up. Leafy cuttings of scion and understock varieties can be harvested upon request during the summer months for green propagation by customers. Currently, FPS utilizes biological indexes, serological tests and DNA tests to determine the presence of virus pathogens in rose cultivars. Biological indexes have been used for decades to detect rose viruses. Sensitive “indicator” plants are inoculated with buds of candidate plants, and the indicators are then monitored for disease symptoms. The development of symptoms on the indicator means that the candidate was virus infected. Indicator varieties are chosen for their ability to display relatively rapid, distinct disease symptoms when infected. Biological tests for rose viruses are very reliable, but they may require up to three years before results are obtained. Two biological tests used at FPS for rose viruses are the Shirofugen cherry index and the Rosa multiflora (Burr) field index. 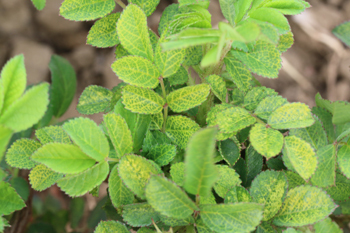 At FPS, Rosa multiflora (Burr) understock is used as an indicator variety for the detection of rose viruses. The field procedure requires at least two growing seasons. This indexing procedure can also be performed in a single season in the greenhouse under tightly controlled conditions for light and temperature. Symptom observations require some degree of interpretation, as abnormalities in plant growth may be caused by environmental factors as well as viral pathogens. To conduct this field test, buds from a candidate variety of unknown disease status are T-budded into the growing branches or trunk of multiflora canes that were stuck in the field and rooted the previous fall. Two multiflora indicator plants are used to test each candidate rose bush. Each of the two indicator plants receives three buds from the candidate, for a total of six candidate buds. Approximately two weeks after budding, the candidate buds are inspected to determine if they are alive - virus transmission is reduced if buds die, and the inoculation may need to be repeated. The indicator plants are visually inspected for mosaic type symptoms several times during the early spring following inoculation. Symptoms may include vein clearing, ringspots, line patterns, mosaics, and leaf distortion and puckering. Symptoms are most clearly expressed in March and April, fading dramatically as seasonal daytime temperatures increase. Field indexing on Shirofugen cherry trees can be performed from the time the cherry trees are in full leaf until six weeks prior to leaf fall. The use healthy, vigorous trees is important. Budwood is taken from three sides of each candidate rose plant being indexed, as the virus can be unevenly distributed and accurate detection depends on a thorough sampling. Buds from the candidate rose are inoculated, using T-buds, to a branch of the Shirofugen cherry. The candidate buds are checked 10 days later, and the indexing procedure is considered valid if at least one of the three buds are still green. Thirty days after budding, the entire Shirofugen branch is removed from the tree at least six inches below the rose buds in order to eliminate any possibility of systemically infecting the Shirofugen tree. The budding rubbers are cut and the bark on either side of the rose buds is removed to expose cambial tissue of the cherry branch. A distinctive gumming and necrosis around the inoculated area indicates that virus is present in the candidate rose. Healthy Shirofugen cherry tissue at the budding site indicates a negative test and the absence of rose viruses. Enzyme-Linked Immunosorbent Assay (ELISA) is a sensitive and rapid laboratory serological method for detecting viruses. To develop an ELISA assay for a particular virus, a specific antibody to the virus is required. Tissue is taken from the plant to be tested (usually the leaf or cambial scrapings) and ground in a buffer solution. This sample from the test plant is pipetted into the wells of a plastic microtiter plate which has previously been incubated with the specific virus antibody. If the sample contains virus, it will be captured by the antibody. After rinsing, another virus specific antibody conjugated to an enzyme is bound to the captured virus. Finally, a clear substrate buffer, specific to the enzyme, is added. Color change in the final substrate buffer solution is the result of binding of the viral antigens in the plant material to the antibodies, and indicates a positive response. Completion of the test requires only two days; however, plant samples must be collected at specific seasons to obtain accurate results. ELISA technology is sensitive, but its scope is limited to detecting viruses for which antibodies are available. FPS laboratory staff routinely uses ELISA to test roses for Prunus necrotic ringspot virus (PNRSV), Apple mosaic virus (ApMV), Arabis mosaic virus (ArMV) and Prune dwarf virus (PDV). Polymerase Chain Reaction tests rely on knowledge of the genome of a pathogen such as a plant virus. PCR involves the selective amplification, using enzymes, of a small part of the virus’ genome or unique genetic code. If the virus is present in a plant sample, even in very low amounts, the amplification steps in PCR allow for its detection. It is this amplification that makes PCR such a sensitive test. PCR only detects specific viruses, but it is much more sensitive than ELISA in most cases. FPS laboratory staff have developed PCR for testing roses for common rose viruses; however, the process is more expensive than ELISA and currently only used in special circumstances. An ounce of prevention is invaluable compared to a cure when the subject is rose viruses. There is no "cure" for an individual plant once it is infected; however, it is possible to "clean up" a variety, i.e., eliminate the virus from the propagating stock. There are several techniques for eliminating virus from an infected cultivar. The two most common techniques are heat therapy and tissue culture. Heat therapy was used for many decades at FPS. In hot conditions, many plant viruses fall apart, lose the ability to infect cells and cannot replicate themselves. In the heat therapy process, potted rose cultivars infected with virus are subjected to constant 100°F temperatures in a heat chamber for a minimum of 4 weeks. Buds are removed from the plant and budded onto Rosa multiflora 'Burr' understock. This plant is observed and tested to determine whether the virus is eliminated. Heat treatment works well for many cultivars but others die in the heat or viruses are still present in the buds that were removed. Although het therapy was heavily relied on in the past for virus elimination, tissue culture is now the method of choice at FPS. Tissue culture therapy has been used successfully for decades to eliminate virus in horticultural crops, such as, orchids, grapes, sweet potatoes, and garlic. Tissue culture therapy involves removing a miniscule shoot tip from the growing point and regenerating a whole new plant from it. A shoot tip, essentially a meristematic dome surrounded by a few leaf primordia, is cut from the virus-infected selection. The meristematic tissue has a unique potential to regenerate a new plant with a minimum chance of mutation, or genetic change, in comparison to plants derived from other tissues. It is not known exactly why virus is eliminated, but one reason it may be successful is because cells in the microshoot tip are growing faster than the virus can infect them. Additionally, the microshoot tip does not have a direct connection to the vessels in the plant, where many viruses are located. From a practical point of view, the smaller the microshoot that can be cultured, the greater the chance of eliminating virus. Unfortunately, the smaller it is, the more difficult it is to regenerate a plant. The microshoot tip is excised under sterile conditions and placed on a growth medium inside a sterile test tube. These cultures are then maintained in a growth chamber which provides controlled growing conditions during the critical establishment phase. Once well developed, which may require 8 to 12 months or longer, plants are transferred into soil, acclimated to normal light and air, moved into greenhouses and screen houses and, finally, to outdoor conditions. At FPS, heat treatment has been replaced or supplemented by microshoot tip therapy for grapevines, strawberries and sweet potatoes. In those crops, virus is successfully eliminated in 90-100 percent of cultivars that are treated. In 2007 we reported successful elimination of Apple mosaic virus (ApMV) and Prunus necrotic ringspot virus (PNRSV) using microshoot tip culture for six cultivars. FPS researchers are now working on optimizing rose shoot-tip culture and are starting to treat modern, heirloom and species roses. Rose scion budwood and understock canes from the FPS disease-tested collection may be purchased for propagation purposes. Because the FPS program is designed to put virus-tested stock into the hands of professional propagators, sales are made primarily to the rose nursery industry in order to establish healthy sources of propagation materials at the production level. Rose enthusiasts benefit indirectly from the FPS program when nurseries use disease-tested stock to produce plants of improved disease status for retail sale. Propagating material is available in the form of unrooted dormant and green cuttings. FPS does not sell rooted plants. Orders must be received by October 15 of each year to be included in the November allocation. Material can also be requested from late spring through early fall on a first-come, first-serve basis. Questions or Comments / E-mail Webmaster / Privacy & Accessibility Copyright 2019 The Regents of the University of California, Davis campus. All rights reserved.